Dr. Allen Hefner was selected as a Finalist for the 2018 Service to America Medal in the Career Achievement category. The Service to America Medals (The “Sammies”), also known as the “Oscars” of government service, are a highly respected honor with a vigorous selection process. 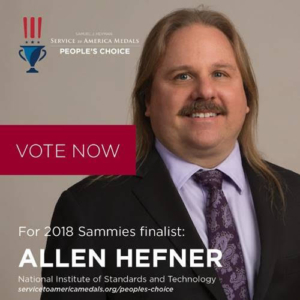 You can vote for Al as “People’s Choice” here until July 9, 2018. PowerAmerica Program Manager Rogelio Sullivan Honored with Award PowerAmerica Funds New Projects to Advance Wide Bandgap Technology in U.S.